The first 100% electric and emission free taxi is set for release in London this year offering a much needed alternative choice with a substantial price differential. 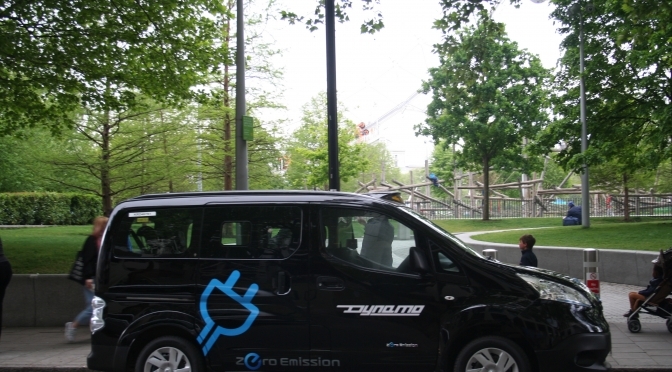 The Dynamo All Electric Taxi, built in Coventry by Dynamo Motor Company, is based on a Nissan e NV 200 Evalia MPV and can ferry around 5 passengers in comfort. The new electric taxi also has another huge selling point. Dynamo have said it will cost less than £30 per week in electricity for the majority and will become the most cost effective taxi in the UK. “Dynamo Motor Company are respectfully and humbly entering into the licensed Hackney carriage market. The Dynamo Taxi isn’t for everybody, but for those who ply their trade in the City, for those who are open to change and can see the benefits of Electric, it fits perfectly. This is a Game Changing Cab! “The range of 174 miles really is a game changer in the Electric Taxi market, it helps to remove any anxieties regarding range that drivers perceive. Being the only 100% zero emissions Taxi, drivers who sit in their “office” for up to 12 hours will no longer be breathing in their own poisonous fumes.